For instance, say that a McDonald’s employee has worked at a particular location for years and is now ready to become a manager. With no positions available at their store, this person could then try to apply at a different McDonald’s location. Unfortunately, that’s when they would learn that the company doesn’t allow employees to join another franchisee’s store. Although businesses must make staffers aware of non-compete clauses, no poach policies can be inserted into complicated employment contracts without the worker’s knowledge. 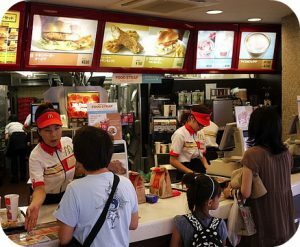 Fast food franchisees have defended the practice by saying it protects the investments they’ve made in their employees’ hiring and training. How do no poach policies limit the opportunities of fast food workers? Why did fast food companies develop no poach policies? Source: Rachel Abrams, “8 Fast-Food Chains Will End ‘No-Poach’ Policies,” The New York Times, August 20, 2018. Photo by Danny Choo.